Skiing is a very famous winter sport. Every year thousands of people travels to hilly terrains to perform the skiing skills. In this article, you will find every details about Skiing. Also, the gear shops and list of Skiing institutes is also given in this article. Hope, this article will be helpful to you! Skiing is one of the Adventurous Sports in India. It is winter sport played in snowy terrain with long, narrow designed boards which are called skis. Skis are supposed to attach to the feets and then move across the Snowy surface. Millions of people enjoy this sport every year. This is a sport which is very important for the physical health of a person. Skiing is a very popular Adventurous sport in India. Every year thousands of tourists come to India for experiencing this wonderful sport. 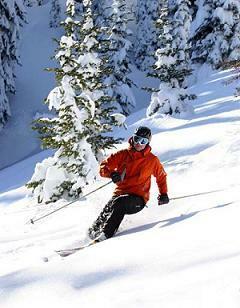 The main place where you will find the Skiing centers in India is Himachal Pradesh. Tourist spot Kufri is a major place where lots of tourists come for Skiing. Another popular place where Skiing is very famous is Manali in Himachal Pradesh. Many Annual Championships of Skiing are conducted in Northern India. You can experience the fun of Skiing during the winter season in India. Heli Skiing is also very famous in India. You will also find many gear stores of Skiing in India. You will find all the details about Skiing in India from SportsVale. You will also find many other Adventurous sports in India such as Paragliding, Hand gliding, Snow boarding etc. If you are planning for a tour to India then don't forget to experience all these sports. The best time to play the snowy sport in India is between December to March. The best place is the north-eastern and northern part of India. You can even have the experience of Rafting in India. Himachal Pradesh is the best place where you can find many Adventurous sports. Skis were used for transporting and hunting in Scandinavia, and also they were used in military maneuvers since 13th century. This sport is more recent in origin as a form of recreation, but there are some evidence that specifies its origin much earlier in 18th century. According to our source record, the first competition of Nordic skiing race was held in Tromso, Norway in the year 1843. Also in 1861, the first exhibition of skiing was held in Kristiansand in Norway. The first ever international game of skiing was held near Christiania in Norway in the year 1892. Sondre Norheim of Norway invented the ski jumping in 1840’s. Then after, the competitions of skiing were started in 1860s. Also, he developed the first binding that went around the heel and the boots were stabilized on boot. Mathias Zdarsky later invented the first binding which was suitable for downhill technique of Alpine. He also wrote analysis of skiing techniques. Thus, he was the first to teach skiing. As skiing spread to the parts of mainland Europe, it was found that the technique was not suitable for mountainous terrain. Therefore, Nordic techniques were adopted for steeper slopes and then Alpine skiing was also developed. In 1890’s Christosph Iselin and Wilhelm Paulcke organized the first ever ski tours of Swiss Alps. Skiing was first discovered in United States in the late 17th century by Scandinavians. This port was also very popular among the California’s Gold miner, who were responsible for making the first Ski factory in 1854. Also, lifts were developed in 1930’s making skiers easy to climb up the mountain terrains. Sir Arnold Lunn organized first major Alpine Skiing races. The first competition was North America Freestyle Skiing Championship held in 1968. Alpine Skiing is a type of Skiing that was derived from the name Alps in Europe. This place was developed for skiing in late 1800's. Then after, Skiing spread to other parts of the world. Also, many lift carriers were made in North America to carry the Skiers to the top hills from where they can Ski down. Many surface lifts that pull the skiers high up to the hills are also available. Many aerial lifts are also there for the skiers. In Europe, cog railways and cable railways are also made to carry skiers up a slope. Nordic Skiing is also known as cross-country skiing. This type of Skiing is done in any terrain which is not much steep. Nordic Skiing is mainly done at the cross-country ski centers. These centers create flat trails for skies. There are two techniques of Skiing, one is traditional traits and the other one is skating trails. The downhill component of cross-country skiing is Telemark skiing. It also incorporates some of the Alpine techniques. For learning basic jumpings of Skiing a few areas have been made for small ski jumps. Wedge or snowplow is the basic technique for the beginners of Alpine Skiing. Controlling the speed and stop, making turns can be done in snowplow. The method used in this is to keep the tips of the skis together and then the tails apart, to create a wedge shape, and afterwards pushing down. For turning one can put the body weight to the side where he wants to turn. But he should keep the skis in wedge shape while doing this. The method of travelling across the width of the slope called traversing. By performing like this they gain skill and then after bring their skies closer until they get parallel. Alpine Skiing Championship also held every year for both men and women. Some more techniques which are used in Alpine Skiing include stem turns, step turns and sideslipping. Stems turns refers to pushing one ski out to the side in a small wedge. The step turns means stepping to the turning ski. The meaning of sideslipping is sliding down the mountain sidesways. To facilate turns in deep or heavy snow the Up unweighting and down unweighting is used. Jumps turns are also used in extreme steeps. Free style skiing is also used by many skiers. When many skiers moves from the same path, then that path becomes bump shaped and is then called Moguls. In cross-country skiing the basic technique used is the diagonal stride, which is also called classical technique. In this Skiers slide their one foot forward followed by other. Also, in this technique they use their polls to propel themselves forward. This free style skating borrows the motions of speed skating. While climbing hills, the skiers put their skis same as the position of skating stride, and instead walks up the hill. This method is also known as herringbone. It is the pattern of tracks that are leaved by the skiers in the snow. In the case of steep hills, skiers are used to place their skis perpendicular to the fall line and also stepping uphill. Nordic Skiing Championship also held every year for both men and women. The downhill techniques which are used in Nordic skiing include snowplow, the step turn and also the parallel turn. The similar manner is also used in Alpine skiing. Telemark turn can also be used by the Cross-country skiers. It is very important to take some safety measures while performing skiing. Also, for more safety ski patrol is present in Alpine resorts. Their main work is to take care of the injuries of Skiers and to make sure that the trails are in good condition. Responsibility of taking their own safety in consideration is also important. For those who are participating in any Skiing sport, it is very important for them to be aware of the Skier's Responsibility Code. In this all the rules of high level safety is mentioned. Another way how Skiers can act responsibly is by following the trail that suits their level of expertise. Green circles are the symbolizes the easy slope in United States. Blue squares are used for intermediate runs and Black diamonds for difficult trails. Sometimes Double black diamonds signs are also used to symbolize difficult terrain. It is very important to read all the Rules of Skiing while performing the skiing skills. These types of boots are designed of hard plastic and the inner part of these boots gives warmth and a snug fit. These boots are attached to the skis by means toes and heel bindings that are perfectly screwed into the skis. Also, the special fact in Alpine boots is that they release from the Ski while falling. Thus this reduces the more chance of injury. Nordic boots are mostly made by leather, and resemble hiking boot to fit into the binding. Hiking boots are resembled by Telemark boots. Only the toe of the boot is attached to the ski in Nordic and telemark binding. The Alpine Poles are usually made of Aluminum and are used for turnings while skiing. The new models of poles are mostly made of thinner and lighter than those of traditional poles. A small plastic basket is present at the end part of each of the pole. It prevents the pole from getting sink into the snow. Poles are very important in Nordic skiing because they are used for the propulsion and also for balancing. He higher end of the poles are especially made up of lightweight composities. As compared to Alpine poles, Nordic poles are longer. Since the outside climate of the Skier remain cold, their clothes are made to feel them warmth. They are designed so that their body feels warm and dry. To dress for Alpine Skiing, the clothes are dressed in layers. The innermost layer provides warmth to the skin and contains moisture. The second layer insulates and the third one resists wind as well as water. The clothing of the Nordic skiers is less heavier than those of Alpine Skier's clothing. Most of the skiers wear helmets for better safety. Goggles are also very important in providing clear visibility to the Skiers. It also functions to protect the eyes from the sharp sun rays..
Aero Sports are very popular in Himachal Pradesh. All the information related to the Paragliding and Hand Gliding in Himachal Pradesh is given in this article. Also, the perfect timing to experience these sports in Himachal Pradesh is also provided. Hope this article will be helpful for you!